One of the firm's financial objectives is to minimize the time between making the payment for inputs and receiving payment for the outputs – the period for which working capital financing is required in the supply chain management process. In an attempt to reduce the level of working capital, a firm has to achieve some goals: to minimize cash available, reduce accounts receivables, extend its accounts payable, and shorten inventory days. To achieve these goals supply chain activities should be related with working capital requirements. 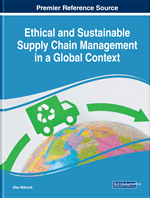 The aim of this chapter is to provide an overview of the relationship between supply chain management and working capital management. A theoretical framework is proposed as an evidence to prove the relationship between supply chain activities and working capital components. Consequently, this chapter investigates how improvements on working capital components can add value to the supply chain process. Supply chain management is defined as the management of all processes that transform raw materials into final products to maximize customer value and achieve a sustainable competitive advantage. A supply chain starts with the delivery of raw materials from a supplier to a manufacturer and ends with the delivery of the finished product or service to the end consumer. A supply chain is the connected network of individuals, organizations, resources, activities, and technologies involved in the manufacture and sale of a product or service (Robbins & Decenzo, 2004). Managing a supply chain is more complex and difficult than managing an individual firm. The supply chain not only consists of more than the movement of physical goods between the members within a supply chain thus, it also involves the flow of information as well as the flow of cash (Fredendall & Hill, 2000). Every business relies on cash flow to purchase raw materials to produce their products. Working capital includes the cash that is needed to purchase its inventory (inputs) and the cash received from selling its product (outputs). The level of working capital reflects the length of time between when cash goes out of a firm at the beginning of the production process and when it comes back in. Working capital, more correctly defined as net working capital, is the difference between the short-term (current) assets and the short-term (current) liabilities of a firm (Van Horne & Wachowicz, 2009). In other words, working capital involves short-term asset accounts such as cash, inventory, and accounts receivable, as well as short-term liability accounts such as accounts payable. Any increases in each of short-term accounts represent an investment that reduces the cash that is available to the firm. Therefore, working capital management aims at minimizing the employed in the firm’s transaction process within its supply chain by reducing current assets and extending current liabilities. Reducing the working capital requirements enhance the balance sheet and reduces the need for short term borrowing, improve its financial ratios and therefore increase the ability to obtain financing for more strategic purposes. Consequently, most firms require certain levels of working capital to make payments to its supplier and receive payments from its customers in a supply chain process. An efficient supply chain management prevents the firm to perform undesirable practices such as receivable extensions to customers, reductions in payable balances, or unbalanced inventory programs (Hoffman & Kotzab, 2010). Working capital management that is closely linked to the physical supply chain, can enhance the companies’ overall financial well-being through supply chain management. Moreover, a focus on supply chain management has usually resulted in significant reductions in the level of inventory held by that firm. Accordingly, the present study identifies the relationship between working capital components and supply chain activities with a contemporary approach. Opportunity Cost: Opportunity cost represents the benefits that is lost by not taking the next best investment alternative. Profitability: As a measurement of efficiency, it refers the ability of a firm to produce a return on an investment based on its resources. Liquidity: The degree to which an asset can be quickly converted into cash without price concession in the market. Cash in Advance: Cash in advance is a payment method in which a customer must send their payment for goods at the same time as they send their order. Collection Float: Collection float is created when a firm receives a check, causing an increase in the firm’s book balance but no change in its available balance. Disbursement Floats: Disbursement float is created when a firm writes a check, causing a decrease in the firm’s book balance but to change in its available balance. Cash on Delivery (COD): Cash on delivery is a payment method in which the purchaser makes payment for a good at the time of delivery. Cash Before Delivery (CBD): Cash on delivery is a payment method in which a firm only sends goods to a customer after they have received the customer’s payment.